The word “monarchy” comes from the Latin, monarchia, meaning, “absolute rule, the ruling of one.” Monarchies, a form of human government, are ruled by a king (or queen) and have been around since early human history. Much of Western civilization has its roots in monarchies. Today, while about 20% of countries in the world are formerly called monarchies, few actually give more then ceremonial recognition to kings or queens. Living in a democracy in the 21st century, the idea of kings and kingdoms is a foreign concept. The U.S. was founded based on the specific rejection of monarchy of the King of England. Americans value independence and reject the idea of being “subjects”, fiercely supporting democracy in the political realm. Catholic men are called to recognize that Jesus Christ is the Divine King, the Messiah and that they are His subjects. Men are called to give total allegiance to the King, to kneel before Him in adoration and continually give themselves to Him. Recognizing the Truth of the Divine Kingship of Jesus Christ can help men become more loyal subjects of Christ. Messiah, or Christ in the Greek, comes from the Hebrew, meaning “the anointed one.” Since the time of the Prophets, a Messiah was foretold who would restore the fallen Kingdom of Israel and bring salvation to the world(CCC 763). Angels foretold of the coming of the Messiah to the Blessed Virgin, calling Jesus “great”, “the Son of the Most High” and that “He will reign…for ever…and His kingdom will have no end.” (Luke 1:31-33). Pagan kings found the Christ Child and “fell down and worshiped Him” (Matt 2:11) and King Herod, fearing his kingdom, slaughtered the Innocents (Matt 2:16). Jesus, the Messiah King, is royally anointed by the Holy Spirit at His Baptism (Luke 3:21-22), and begins to preach about His Kingdom, saying, “Repent for the Kingdom of Heaven is at hand” (Matt 4:17). The devil tries to unsuccessfully tempt Jesus with “all the kingdoms of the world” (Matt 4:8). Andrew and Peter realize that they “have found the Messiah” (John 1:41). Jesus continually teaches about the Kingdom of God throughout His ministry: in the Beatitudes (Matt 5:2-12), in numerous parables and in the Our Father (Thy Kingdom come, Thy will be done…). The people attempt to forcefully make Him king (John 6:15), but Jesus instead later enters Jerusalem like a Davidic king (CCC 560). Pilate mistakenly concludes the Jesus is simply the King of the Jews and has Jesus crucified when the people say, “We have no king but Caesar” (John 19:15). After the resurrection, Jesus teaches for forty days about the Kingdom of Heaven (CCC 659). 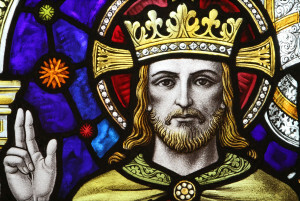 The Catholic Church has always recognized the Divine Kingship of Jesus Christ and reserves the last Sunday of the liturgical year for the Feast of Christ the King. The Kingdom is an urgent reality – Jesus greatly emphasizes the Kingdom of God/Heaven and that men must urgently turn towards Christ, for the Kingdom is ‘at hand’ (cf. Luke 9:60; 9:62). Jesus Christ is the Divine King – Jesus is the Christ, the Son of God, the Son of King David, the King of Kings, a Divine King anointed by the Holy Spirit (CCC 436). He “accompanies His words with many “mighty works and wonders and signs”, which manifest that the kingdom is present in Him and attests that he was the promised Messiah” (CCC 547). He performs many signs to make known the Mysteries of the Kingdom of God (CCC 1151). He is the Perfect King (CCC 578), a Merciful King (CCC 545), a Heroic King who comes to free the slaves and the poor (CCC 544) through His own sacrificing death. Jesus Christ has complete dominion as Divine King – Jesus, as Divine King, sits at the right hand of the Father and has an everlasting dominion (i.e. authority, rule and power) over all men (CCC 664; Matt 28:18). Jesus warns that “all judgment is given to the Son” (John 5:22) and that those who do not do the will of the Father will not enter the Kingdom (Matt 7:21). All men are called to be His devoted subjects – Jesus calls all men to conversion, to repent and work for the Kingdom (CCC 2608). Men ultimately must choose who they will serve, either Jesus Christ or Satan “who act(s) in the world out of hatred for God and his Kingdom in Christ Jesus” (CCC 395). Men must give their complete devotion to Jesus Christ as the martyrs have done, with “matchless devotion towards [our] king and master” (CCC 957). As subjects, men are called to serve the Divine King – Men are called to pick up their crosses and follow Jesus. He warns that lukewarm commitments or attachment to riches keep men from the Kingdom of Heaven (Luke 18:25). “One must give everything…Words are not enough, deeds are required” (CCC 546). Though subjects, men are part of a royal office of Jesus Christ (CCC 786). Men are called to be the King’s co-workers (CCC 307) to hasten the fulfillment of the Kingdom (CCC 2046). Men must give obedience to the Church – Jesus, the Divine King, gives Peter the keys to the Kingdom (CCC 553) and supreme earthly authority has passed to each successive Pope and the college of bishops (CCC 869). Catholics are called to obedience to the teachings of the Church (CCC 891). Men are called to adore Jesus Christ the Eucharist – The real presence of Jesus Christ, the Divine King, is in His Church and in the Eucharist (CCC 1088, 1373). In the Mass, men are given a foretaste of the Kingdom of Heaven (CCC 2770). “Adoration is the first attitude of man…[and] homage of the spirit to the “King of Glory” is a necessity… (CCC 2628). Men are called to worship the Divine King through adoration of the Eucharist: “The Catholic Church has always offered and still offers to the sacrament of the Eucharist the cult of adoration, not only during Mass, but also outside of it…” (CCC 1378). Like many who were awed by Christ in the Gospels, all men are called to kneel and worship their King. Men are called to evangelize – Jesus commands the Apostles to spread the Good News of the Kingdom to all the world (Matt 28:16-20). As subjects of the King, “the laity are made to share in the priestly, prophetical, and kingly office of Christ” (CCC 873), “to spread the Kingdom of Christ over all the earth” (CCC 863).